The SP 4110N MICR delivers one of the fastest page-per-minute speeds offered in the desktop category. Advanced networking capabilities, robust security options and an easy-to-use control panel combine to make it the perfect shared printer for workgroups or small businesses. The SP 4110N MICR offers an array of Rosetta Technologies Intelligent MICR features including a programmable online dashboard that provides access to job queues, highly configurable alerts and robust reporting options. The SP 4110N MICR printer offers flexibility and robust features that make it suitable for desktop or workgroup environments. E-13B FONT.� This font was created specifically for the SP 4110N MICR printer. 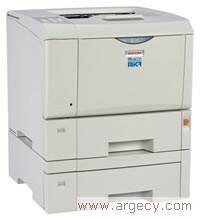 The printer specific font ensures the highest achievable readability of MICR characters. ORIGINAL-MANUFACTURED MICR TONER CARTRIDGE. Toner formulation and cartridge design specific to the SP 4110N MICR printer engine, ensures high print quality, excellent toner yield, and long fuser life. MICR QUALITY GUARANTEE. Rosetta Technologies ensures the readability performance of the SP 4110N MICR printer when used in conjunction with approved MICR toner and check stock. SECURE AMOUNT FONT: This unique font is very difficult to alter because of a special background and very small text & numeric print embedded in the amount line of the check. PASSWORD PROTECTION: The SP 4110N MICR offers up to 10 user IDs and passwords that prevents unauthorized users from printing to the printer. DATASTREAM ENCRYPTION: This feature sends secure, encrypted data from the host. The data is then received and decrypted by the printer. This helps to combat check fraud because it makes it impossible to intercept the print stream data. The SP 4110N MICR printer is highly configurable so that it can be customized to your specifications. Whether you need WiFi connectivity, a hard disk drive for added storage, locked paper trays for additional security, or an IPDS model, the SP 4110N MICR offers the options to meet your needs. The SP 4110N MICR also has optional duplex check printing. This allows everything to be printed in one pass on blank safety stock, pressure seal, or other check paper. This improves hardware utilization, cuts your paper costs, and leads to a quick and sure return on your investment.